It's fair to say I've been in a foul mood over Doctor Who for a long time now. After enduring the shower of piss that was The Stolen Earth/Journey's End, and then the tedious dross meant to tide us over until the arrival of season five (four episodes spread out over 2009, oxymoronically called "specials"), I was wondering if I would ever feel the magic again. I've been feeling it this season, and as magic is supposed to be received: like a child (cf. Mk 10:15/Mt 18:3/Lk 18:17). Steven Moffat knows children, how to cast them, and what buttons to push to make their fears become ours. The season is shaping up to be a dark fairy-tale like Alice's Adventures in the TARDIS. At the same time, I was somewhat let down by The Beast Below for failing to deliver the goods promised in the opening sequence of the story. 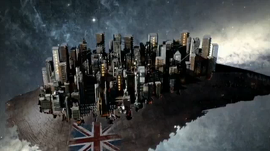 And what an opening sequence it is. Moffat immerses us right away in the unsettling world of the Starship U.K. from a classroom child's perspective. Timmy gets a bad grade and is banished from using the elevators to get home, but he takes one anyway. What happens inside is horrifying: a video starts playing of a young girl reciting ominous poetry, warning to "expect no love from the beast below"; the Smiler on the opposite wall spins its head 180 degrees, facing out a hideous contortion of demonic rage (see upper right photo); and the elevator floor slides open to reveal a hellish pit below. As he falls, Timmy's screams are reminiscent of those of the victims in Gridlock and Planet of the Ood -- perfect segues into the sting and thundering Doctor Who music, promising a roller-coaster ride of terror ahead. That ride doesn't come, however. The Smilers may be scary looking, but it never goes beyond looks. They don't kill anyone and are way too easily disposed of by Her Majesty, the cavalierly pistol-slinging Liz Ten. In fact, in this story -- and in what is becoming an alarming trope in Moffat scripts -- "everyone lives". For all of Moffat's brilliance in serving up the scares, he has as an astounding aversion to killing off significant characters. This is something classic Who was never squeamish about. 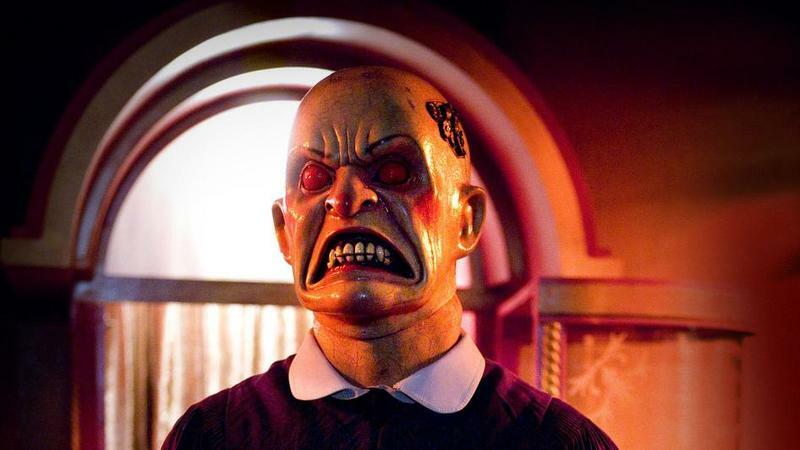 Moffat did give us tragedy in two stories, The Girl and the Fireplace (Madame de Pompadour) and Blink (Kathy Nightingale and Billy Shipton), naturally his best to date. Silence in the Library/Forest of the Dead would have been as good if not for the afterlife scenario which trivialized River Song's sacrifice. In The Beast Below no one comes to any harm at all, and frankly, after the opening sequence, we never feel like anyone is in much jeopardy. Though to be fair, that is somewhat the point, because the Smilers ultimately serve the Queen without her knowing why or how. The beast below is the true victim, a starwhale held captive and tormented so that it will keep ferrying the ship through space. The British people are victims of their own decisions more than anything, made every five years in the voting booths. Videotapes explain that Starship U.K. runs not on engines but by harnessing the power of a tortured starwhale, and each person votes either to forget this horrible truth and live on in ignorance, or protest the truth -- which, with enough votes, will supposedly put an end to the beast's suffering (and leave Britain stranded among the stars), but in fact gets the voter fed to the whale below. 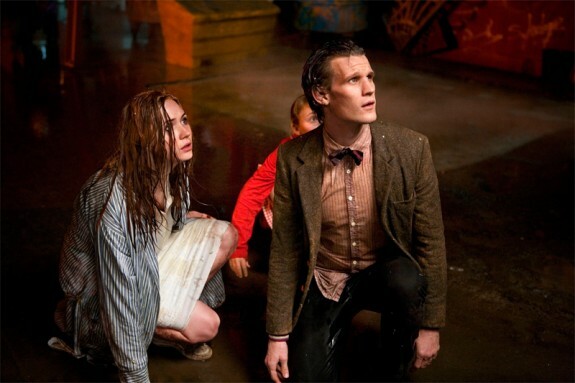 (The Doctor and Amy landing in the beast's mouth, drenched in putrid feculence, is a priceless scene.) But the brilliant twist comes at the end, when it is revealed that the beast doesn't even need to be tortured to carry the starship. It began doing so voluntarily, as the last of its kind unable to bear the screaming of Earth's children dying from the solar flares. It loves children and refuses to harm them, meaning that all children who have fallen into the pit are still alive. That's a cop-out, mind you, but at least feeds into a certain theme of the story. For The Beast Below works on two levels, one as a political fable about society kept in ignorance, if democratically by their own choice, and two as a metaphorical commentary on the Doctor's nature. The last of the starwhales allows Amy to understand the Doctor better, and more polysemously, than previous companions. The way Moffat milks a philosophical purpose out of the whale like this will undoubtedly offend some viewers as crass, but I actually think it works well; the end revelation plays authentically. And the best part of this revelation is that it is indeed Amy, not the Doctor, who ends up saving the day. She sees the similarities between Time Lord and beast -- both the last of their kind, both committed to helping others out of an alien compassion -- while the Doctor is caught up in helpless fury as he works to destroy the whale on humanity's behalf. Smith conveys contemptuous arrogance remarkably well, as he lambastes Amy for trying to spare him making the difficult choice, culminating in his frustrated holler of rage, "Nobody talk to me! Nobody human has anything to say to me today!" This puts us immediately in mind of the brusk and ineffectual Ninth Doctor who so often (70% of the time) was more a problem than a solution. This flawed aspect of the Time Lord is something we haven't seen in a while; the Tenth Doctor was more a self-mythologizing superhero (we got an exceptional dose of his fallibility in Midnight). If the opening sequence is the best part of the story, the epilogue is a close second: the Doctor tells Amy, "You could have killed everyone on this ship," and she replies, on near equal footing, "And you could have killed a starwhale." Welcome Amy Pond. It should be noted how much this story mirrors Full Circle, which was unique in the Tom Baker years for having no villains (as in this story, people are their own worst enemy), and the same plot ingredients: cyclic patterns of a society going nowhere, unethical treatment of other species, and collectively willful ignorance. Both involve plot twists and surprising revelations, and while The Beast Below lacks the layered complexity of the E-Space classic, and refuses to show us the beast killing anyone (unlike Full Circle's marshmen), it is daringly impressive nonetheless. In sum, The Beast Below marks a successful movement into a season which is taking us down the rabbit hole. Provided we start seeing some actual body counts, and soon, I have confidence in where we're going.